PERFECT SIZE FOR SUCCULENTS & PLANTS – The easy access opening makes creating and tending to your garden a simple affair, while the spacious interior gives you plenty of room to get creative. Add succulents, moss, soil or rocks, and build your own little paradise! DISPLAY KEEPSAKES & MEMENTOS – Glass terrariums are a great way to display your memories. Decorate them for holidays such as Halloween and Christmas, or use them to hold keepsakes, small figurines, or candles – the list is endless! MODERN DESIGN – The Mindful Design Diamond Terrarium is made of high quality glass, and comes in a variety of eye-catching colors. The geometric shapes create sleek lines, exuding style and accentuating any and every room. PERFECT ADDITION TO YOUR HOME – Make each space more beautiful than the last. Perfect for offices, windowsills, patios or kitchens, our stylish glass terrariums are a gorgeous way to add an artistic touch. PRODUCT SPECIFICATIONS – Each terrarium measures 6″ x 6″ x 7.5″. Plants not included. 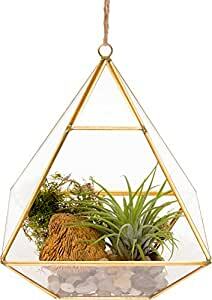 Bring beauty to any space with this gorgeous Diamond Geometric Terrarium by Mindful Design. Crafted from high quality glass and a durable metal frame, these stylish terrariums help liven up any room they’re placed in. The easy-to-access opening makes placing items inside easy, and the spacious interior is the perfect home succulents, air plants, fern and moss. Get creative and fill with any combination of plants, soil and rocks – the possibilities are endless! These terrariums are also a great way to display mementos and keepsakes, and look wonderful in your home or on your patio. Each terrarium measures 6″ x 6″ x 7.5″. Plants not included.